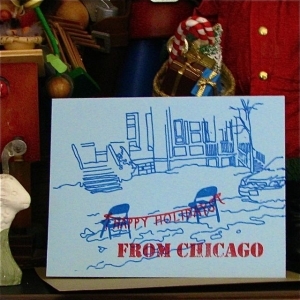 This season, bypass the Hallmark card aisle and spread some holiday cheer by representing Chicago and its artists with these five city-centric Christmas cards. 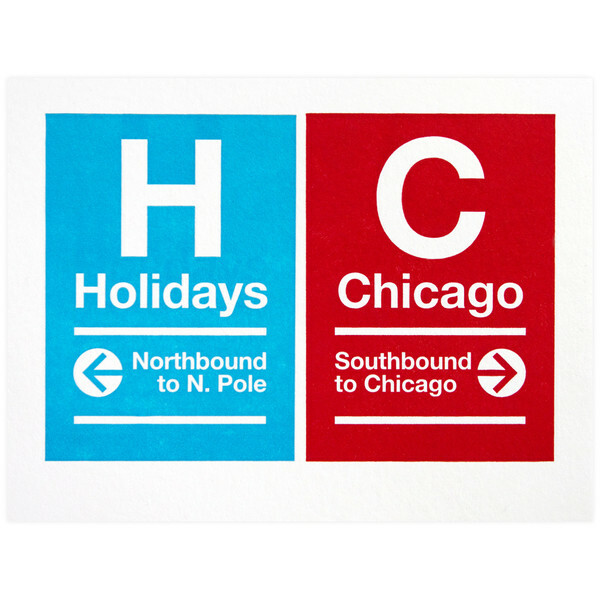 These letterpress cards mimicking the city’s El signs are sure to direct your loved ones home for the holidays (pictured above). All of a. favorite designs are handmade at their Ravenswood Corridor studio space on one of the company’s presses—a 1913 c&p handfed press and a c&p automatic press. $16 for a pack of six. Available at Greer, 1657 North Wells. In 2012, Paper Parasol Press made the move from Chicago’s windy streets to San Mateo, California. But that doesn’t mean they’ve forgotten their roots. 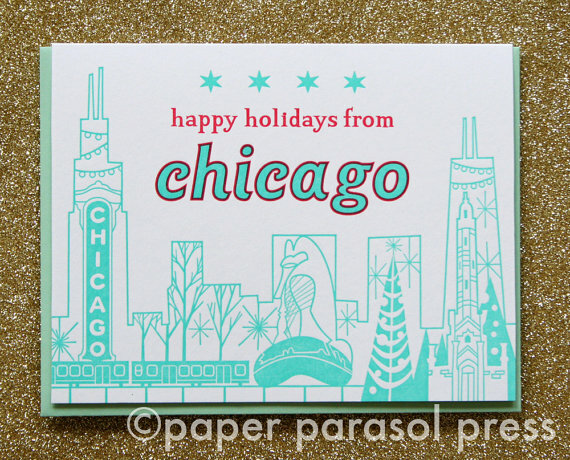 Paper Parasol Press has a variety of letterpress holiday cards that represent Chicago. With the El, the Bean, Picasso, Water Tower, and skyline—no other card encapsulates being a tourist in your own city quite like this one. $5.15. Paper Parasol Press will be at the Show of Hands Craft Show, November 23-24, 4043 North Ravenswood. It isn’t winter in Chicago until you wake up at 5am, spend two hours digging your car out of the snow, and stake your parking-space claim with a few metal folding chairs you accidentally stole from your neighborhood grade school’s lunch room. Founder of La Familia Green and SAIC graduate Mollie Green works out of a studio in Rogers Park where she creates all of her original designs before sending them to a wind-powered offset print shop. 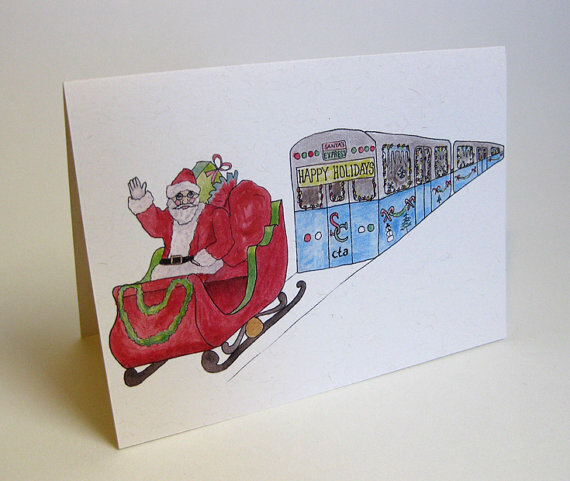 No one will appreciate this card as much as your city worker uncle from Beverly. $3.50. Available at RR#1, 814 North Ashland. Looking for a direct yet subtle way to remind that cousin from Des Moines that you’re tis’ing the season in the best city in the Midwest? 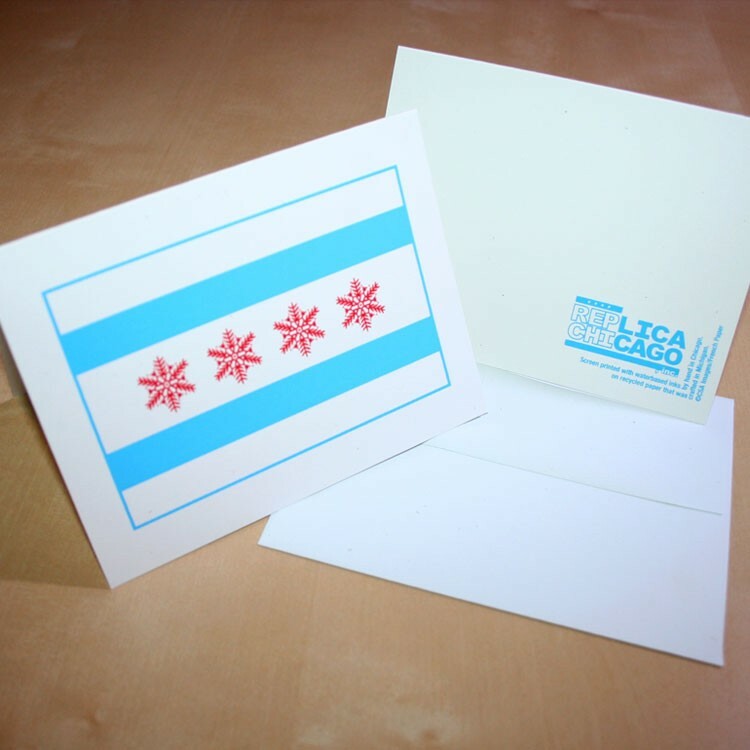 Look no further than Rep Chi’s Chicago Snow flag card. Hand-screen-printed in house, this card is clean, nondescript and can be sent to all of your correspondents well all winter long. $4. Available at Replica Chicago, 4425 North Milwaukee. Spread the joy of the CTA’s annual holiday train without having to endure the headache of Ventra or the heavy breathing of the guy sitting next to you. Kelly Parsell, the woman behind Nerdpress, holds an MFA from Columbia College’s Book and Paper Arts Center. All of her cards are printed from original ink and gouache illustrations. $3. Available on ETSY @nerdpress.